A black and white large format negative of a nine week old puppy sitting for a picture. The majority of writing on the negative envelope is illegible. Nine weeks and the date are legible on the negative envelope. 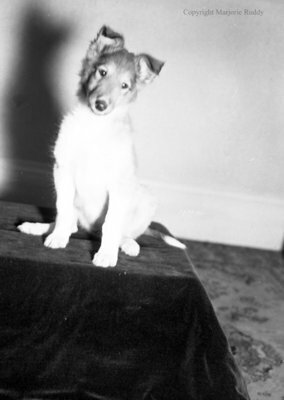 Nine Week Old Puppy, March 18, 1950, Marjorie Ruddy. Whitby Archives A2013_040_266.